Listening music online is a passion for any people around the world. This passion comes at a cost and it can become a nightmare for people who use a limited data plan. Opera Max the app that reduces data now supports compression of files with mp3 and many other extensions. This is a new feature and you can find in the latest release of this app. Music and videos have a larger size than a normal text document. Thus, a software or app that plays online media content will consume a higher volume of data. Opera max will analyse the music file before it is being streamed or played from an online service. If it is highly compressed and needs no optimization, the file will be played immediately. If it is not, this app will send the music file to the nearest Opera server. The remote machine will compress and send the file to user’s mobile device. The compression is achieved by conversion of mp3 files to AAC format as a result of which the file size is reduced. The quality of the music will not be affected when they’re converted. 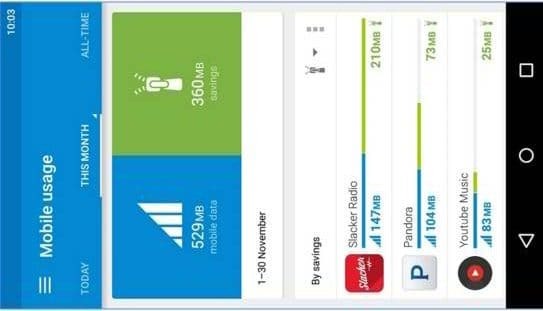 Why Opera Max is amazing and money saver? In India, 1GB 3G data costs around 250 Rs or 4 dollars (It is impossible to enjoy music or watch videos over a slow GPRS connection so forget about 2G for a moment). If you’ll play 100 files, each having 5 or 6 megabytes length, you’ll lose 500 MB of data. Thus, your data plan will expire before its validity. Downloading music files from the torrent and other similar sites is illegal. There are some subscription services that allow you to download your favorite song for a few cents. Does this app support all streaming services? As of now, this Opera Max supports Pandora, YouTube, and Slacker. These 3 services are available in the US, Europe, and some other countries. In India, this app works with Gaana, Saavn. If you’re using the outdated version of Opera Max, make sure that you update it immediately as the new release will save tons of data for you [Download it here]. What are the other apps and devices that will save your data? Airtel Wynk features a data saver module that claims to cut down data usage by 70 percent when enabled. Samsung On5 and ON7 phone include similar feature and it works for all types of content streamed i.e video files, documents, etc (I don’t know how much data the phones will save when you stream music and watch movies online).